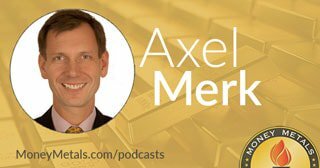 Coming up Axel Merk of Merk Investments joins me for a terrific conversation about gold, the Fed, stocks and the dollar. And find out why he believes investors will soon realize that it DOES matter again about where you put your money. Don’t miss my interview with Axel Merk, coming up after this week’s market update. Gold and silver markets closed out the month of January on a high note as the Federal Reserve signaled it would back off on further rate hikes. On Wednesday, Fed policymakers voted unanimously to leave the central bank’s benchmark interest rate unchanged. Fed chairman Jerome Powell cited recent weakness in economic growth forecasts. Left unspoken was the recent pressure directed at the Fed from the White House and Wall Street. The stock market plunge in late December set off multiple alarm bells and even activated the Treasury Department’s Plunge Protection Team. The Fed got the message, and Wall Street seems to be back on good terms with monetary planners. Stocks posted one of their best January performances on record. On Wednesday, President Donald Trump celebrated the Dow Jones hitting 25,000. However, he didn’t mention that the best performing sector this week is the gold miners. The HUI gold mining index popped over 7% higher into Thursday’s close. Gold itself is up a more modest 1.1% this week to bring spot prices to $1,318 per ounce. Silver trades at $16.01 an ounce after rising 1.4% on the week. Platinum is putting in a weekly gain of 1.3% to trade at $833. And finally, palladium is flat for the week to come in at $1,373 per ounce – now just slightly ahead of gold. Well, gold is at the center of a geopolitical crisis now playing out in Venezuela. The Venezuelan government is scrambling to get ahold of its own gold reserves after the United States imposed economic sanctions on the country and the United Kingdom refused to release $1.2 billion in gold held on behalf of the Maduro regime. The United States officially recognizes Juan Guaidó as the acting President of Venezuela – even though he hasn’t yet formed a government or removed Maduro from power. The socialist incumbent Maduro still has the backing of China and of Russia. He reportedly sent 20 tons of gold to Russia on a cargo jet shrouded in mystery. Whether Maduro is trying to steal the country’s gold or prevent it from being stolen isn’t clear. The long-suffering Venezuelan people have certainly had much of their wealth stolen through hyperinflation that is now approaching 2 million percent. As of this recording, the Bank of England is still freezing Venezuela’s gold. The unprecedented action is raising grave concerns about trust and counterparty risk in the global financial system. RT News Anchor: Meanwhile, the Bank of England is facing increased pressure to hand Venezuela's assets to Nation Assembly President Juan Guaido. In a press conference at the White House, Treasury Secretary Steve Mnuchin said that 1.2 billion dollars’ worth of gold could be available to Guaido after President Nicolas Maduro was blocked from the account. Richard Wolff: And you can be sure that every government in the world is going to rethink putting any money in London, as they used to do when they're watching this political manipulation. It makes a mockery of every international agreement that we know of about non-interference in the internal affairs of other countries. We in the United States are busily going through a multi-year program to see whether the Russians had some role in the United States. Nothing remotely like what the United States and perhaps now Britain are doing inside of Venezuela. Neo-conservative hawks within the Trump administration are bent on toppling Venezuelan President Nicolás Maduro and aren’t ruling out a military invasion. Secretary of State Mike Pompeo appointed Elliott Abrams, one of the main architects of regime change in Iraq, to oversee regime change in Venezuela. The Trump Administration’s hasty pivot towards regime change has drawn surprisingly little opposition from Democrats. Perhaps that’s because it is the deep state calling most of the shots on foreign policy and not President Trump himself. Yet when it comes to domestic policy, the hyper-partisan environment in Washington threatens to bring about another government shutdown or declaration of national emergency later this month. One of the few genuine opportunities for bipartisanship would be an Audit the Fed bill. In January, Representative Thomas Massie reintroduced the Federal Reserve Transparency Act with a Democrat co-sponsor. This bill, which would subject the Board of Governors of the Federal Reserve to a full audit, has garnered a large Congressional majority of support in the past. It would probably win majorities in both the House and Senate in spite of the existing partisan divide between them. The problem has always been whether it can get through procedural hurdles put up by the Fed’s legislative shills. House Speaker Nancy Pelosi may simply refuse to put Audit the Fed up for a vote. And in the Senate, where a filibuster-proof majority is always hard to obtain, Chuck Schumer is a master at blocking legislation on behalf of central bankers. Some progress on the sound money front continues to be made at the state level. In January, the Arizona legislature took up the Sound Money Stabilization Act. It would require that at least 10% of Arizona’s Budget Stabilization Fund be held in precious metals in a secure depository. In 2017, Arizona removed all state income taxation on gold and silver. Last year saw the passage of the Wyoming Legal Tender Act. It reaffirms gold and silver as constitutional money and removes all state taxation of them. Sound money advocates in Wyoming and Arizona legislatures are now pushing bills to provide that a small portion of state assets be held in the monetary metals. It’s still a major uphill battle to persuade states to protect themselves by holding gold and silver. And a number anti-gold naysayers in Wyoming have already come out of the woodwork to oppose the idea, even as they defend the state’s devasting losses on investments in Third World debt. In West Virginia, legislators will have a chance to vote on the West Virginia Sound Money Act. It would remove all taxation against gold and silver, including sales and use tax, property tax, individual income tax, and corporate income tax. The Sound Money Defense League and Campaign for Liberty are helping to garner public support for these and other sound money initiatives in states across the country. Mike Gleason: Well Axel, we want to get your thoughts here as the market seemed to be in a bit of flux. A few months ago, pretty much everyone was looking at three or four rate hikes and for Quantitative Tightening – the reduction of the central banks bond holdings – to continue, but then the higher rates and prospects of further tightening finally caught up to the equity markets. We had three months of sustained selling in stocks late last year and suddenly Fed officials are singing a very different tune. Today they are signaling a much more dovish policy, however we've seen a big rally in stocks, it isn't clear what to expect. Since the equity market seems to be a major factor when it comes to FOMC policy. Tell us what you're expecting here and before we get too much into Fed policy, moving forward which I'll ask you about in a moment, tell us is the selling we saw in the fourth quarter all behind us or is this a bit of a sucker's rally in stocks. A few things here, the U.S. consumer is doing just fine. Maybe they’re going to fall off a cliff, we don't see that yet. Inflation impressions are increasing no matter what everybody is telling you, wages are going up, not just for the C.O. (level), but all the way down the corporate ladder. Yes there are issues in the rest of the world and yes we are late in the economic cycle. And so, what all of that means is that higher rates to me automatically translates to more volatility. So, the high volatility is just natural. Obviously, it may have been exasperated, you can blame the algos, whatever you want, but yes higher volatility is with us. Historically, we don't have a bear market, most of the time anyway, unless there is a recession and I just said I don't think the recession is imminent. Now that doesn't mean there isn't a risk of one, that doesn't mean volatility isn't high, it doesn't mean investments aren't going to diversify but certainly long in the tooth on this expansion and so everybody may well be prudent to kind of trim things back on their risk exposure and that’s exactly what's been happening. But for the time being, I do think this economic cycle is not over yet. We are late in it. I also happen to think, I mentioned inflationary prices, the Fed is not done tightening. We've gone overboard on that and I think we will likely see two more rate hikes later this year. Mike Gleason: As we're talking here on Wednesday afternoon, Fed chair Powell just came out with his statement. Tell us what you took from that. Sounds like you're still expecting that we are going to see a couple more rate hikes this year… talk about Fed policy a bit more. Remember when Yellen talked about paint drying on a wall when they started on this journey. Basically, they decided the Fed balance sheet is too large, they want to get down but that's about all they decided. They didn't make up their mind of where that journey is going to take them. In my view, they thought that they had until the end of this year or so before they can actually decide how low they want to take the balance sheet so sure enough the market threw a tantrum and Powell said "Okay I get it we got to do something" and at the FOMC meeting he kind of said "we still don't have a clue". He didn't use those words but "yeah we might consider doing something" and that really shows that the Fed doesn't have a plan with Quantitative Tightening. They're in so called 'uncharted territory' and there's no academic framework, no past of framework other than listening to the markets and that's really dangerous because it’s the Fed that's supposed to set what the risk-free asset is. The regulatory risk free asset treasuries. And so, when the Fed just says "hey let the market dictate that" it creates an interesting unstable back and forth. I'm not suggesting that wouldn’t be better if he market did everything but with the Fed in there with a bazooka that kind of creates odd dynamics. Axel Merk: The biggest story may not always be what the biggest impact is. You rightfully mentioned China first. China is just so much bigger so what happens in China matters. China clearly has had a slowdown. They have all kinds of incentives along the way to try to boost that. They’re trying not to actually lower rates so they're actually lowering most of the reserve requirements and have tax cuts. They don't like to lower rates because they don't like to mess with the exchange rates too much. They like to keep that reasonably stable, whatever that means these days with the yuan. And so, there is some slowing down. If they quote unquote 'panic' it means they'll open the floodgates of stimulus but for the time being they're reasonably confident that the stimulus will work its way through. The quote unquote 'bigger story' may well be Brexit even Powell referred to it keep in mind, the good old great empire is about less than 3% of world GDP these days. So yes Brexit matters but it doesn't matter as much as some other things out there. Similarly, Italy that was the sideshow, mostly a show, and sure there are going to be elections in the European Union and sure the populists are going to get more votes but none of that really changes the global dynamics. Obviously, what does happen on global scale are the trade discussions. The general perception is: there are solutions. They're not going to happen there tomorrow and if you listen to Draghi the head of the European Central Bank, he says “Oh, we downgraded our outlook, but it’s not that we think that we going to be negative outcomes to these many risk scenarios.” That’s what Draghi said, he actually thinks there’s going to be positive outcomes to most of them but because of the uncertainty, the sentiment has been impacted so that's dragging on things and obviously the sentiment is impacted, and that's the same danger with the U.S. consumer of course, is that that might actually then induce slower growth. Mike Gleason: Let’s get your thoughts on what all of this might mean for precious metals. Can you give us a quick summary of what you're expecting in the metals market as we move through the year. Axel Merk: Yes sure. On gold which is kind of the easiest because of the least industrial influence that's difficult enough to prognosticate about. You've got these two forces. On the one end I see rising inflationary pressures, that's a positive. I see at some point rates are going to go down as a discounting mechanism. The market seems to be giving a boost here to precious metals. Now with that said, I do think rates will move higher later this year. The main buyer in gold that I see these days is one that buys for diversification. When you have higher volatility cash flow gets discounted more. That means the risk assets, stock market in particular, is under pressure potentially but gold historically does well when the stock market doesn't do well. There are exceptions like the early 80's, bear market and that's when real interest rates went up to through the roof. But it is for diversification because gold is really one of the easiest diversifiers… I say easier rather than best necessarily because it has the zero correlation to stocks and it’s far easier to do than some long-short strategy that gives you an uncorrelated return otherwise. And then I happen to think the glass is half full on some of these inflation metrics. On that note by the way, we have low oil prices at the end of last year. If oil prices are not depressed any of this year, the year-over-year effects will show quite significant headline inflation. In the Eurozone, by the way, headline inflation is the mandate. In the U.S. it’s core inflation. But if you look at longer term inflation expectations, they happen to be very correlated to the price of oil. It may not make much sense because obviously in the long-run the price of oil of today doesn't really matter. But as those changes are filtering through, I think inflation expectations will rise. Wage prices will lead to higher wages inflation expectations. So, all of that will get other leaders around also to be a tad more hawkish and it appears to be that is in favor of world currencies versus the dollar that just had such a great ride for several years and so it appears to me that this long bull run in the dollar might be over. Axel Merk: Sure. Come to MerkInvestments.com. We publish research charts on the Fed on all kinds of things. We do have some investment products including a gold product. Look around on our site we do a lot of work on currencies. If you want to get my up to date commentaries feel free to follow me on Twitter or LinkedIn or whatever your favorite social media site is. We're there to help and we can even devise some specialized strategies to take a position on interest rates if that's something somebody's interested in. We do a great deal of things. Also we got a mandate the other day to manage a precious mining fund and that's still subject to shareholder approval but if and when so, we'll be talking a lot more about the specific mining companies down the road as well.